Shane Price, founder of Green Circle Salons. Have you ever assessed what goes into your trash? Have you counted the number of bags that hit the dumpster every night after the salon closes? Maybe it’s time you should. When a Toronto salon owner told entrepreneur Shane Price how much trash the salon generated every day, Price was astounded. Not only is it bad for the environment, in Canada, you pay a fee for every bag of trash you need picked up. In the past five years, more than 700 salons across Canada and the U.S. have signed up for the program, and Price, who is founder and CEO of Green Circle Salons, wants the entire industry on board by 2020. Many salon owners keep their businesses “green” through recycling, LED lighting, energy conservation and other eco-friendly practices. But there are still a lot of materials that go to waste every day, including hair, leftover color and foils. Green Circle Salons has set out to make salons fully sustainable businesses. “We looked at all the elements of the business and created a set of solutions that work well in the salon industry,” he says. Green Circle focuses primarily on three things: helping salons be genuinely green, helping them build revenue and helping them gain new clients through its green salon directory. When a salon signs on with Green Circle Salons, a one-time fee of $99.95 is required, and if the owner wants the salon to be in the green directory, an additional one-time fee of $149.95 is paid. “We need that initial fee to pay for shipping materials like marketing kits, shelf talkers and bins out,” says Price. After a salon is on board, a representative from Green Circle Salons comes in and does a 45-minute orientation with the team. “We explain that being green means you’ll recycle hair clippings, foils, chemicals, paper, plastic, batteries, lights—that’s 85 to 95 percent of salon waste we’re able to divert,” says Price. Price adds, “There are all kinds of things salons can do to reduce their footprint—we create a funding mechanism for that.” Green Circle suggests salons set up a “green” savings account specifically for these funds and at the end of the year—before taxes—go spend it on technology. Now recycling is simple at Studio Luxe. Green Circle came into the salon, did a presentation, then set them up with all the materials they need to successfully recycle almost everything. Cardboard boxes, labeled for metals, plastics, paper and hair, are on the salon floor and in the back room. The Groenenbooms simply put stickers on the boxes to indicate what they are for and explain to guests that they’re a sustainable salon. Jeff and Tiffany Groenenboom, owners of Studio Luxe in Naperville, Illinois. For the colorists at Studio Luxe, this is a great visual for how much waste is being created, which helps them be more efficient. But where do all these excess chemicals go? What about all those other boxes of foils, hair and other materials the Groenenbooms are collecting? Green Circle has a process for those, too. “The size of the salon and how much recycling they have determines how often we come to pick up their boxes,” says Price. 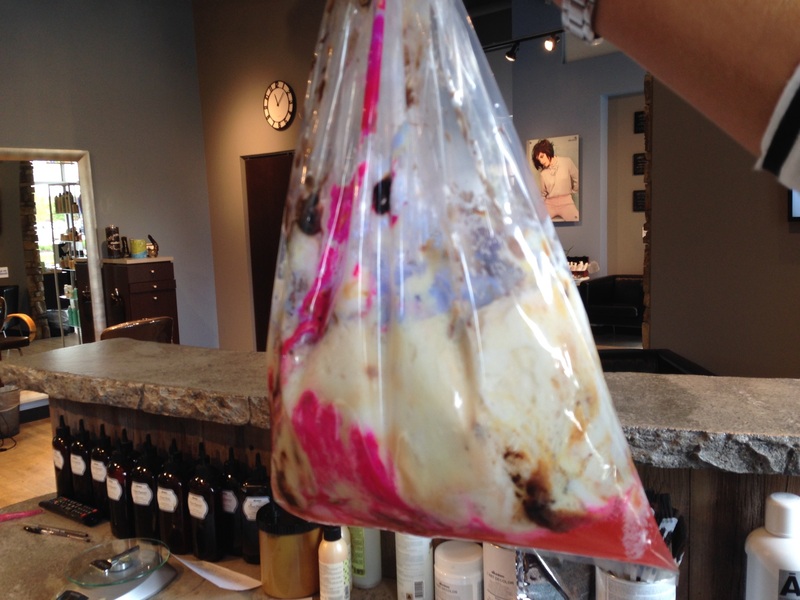 A week's worth of color waste from Studio Luxe in Naperville, Illinois, which will be collected by Green Circle Salons, also serves as a visual reminder to be more mindful when mixing formulas. Next, the materials are taken to one of Green Circle Salon’s five warehouses (four in Canada, one in Chicago). “We bring all the materials into one location and then work with specific places to recycle,” Price explains. Once a salon has committed to Green Circle Salons, they get put in the green directory, which consumers can use to look for eco-friendly salons in their area online or with an app. The directory links not just to salons’ websites, but also to social media, including Facebook, and videos, if provided. “We also give salons a digital welcome kit when they join so they can link back to us” says Price. Once a salon is part of Green Circle, they can take their message out to clients and staff via shelf talkers, mirror clings and stylist/client conversations. At Studio Luxe, Jeff Groenenboom has found his clients are excited to feel they are a part of something, and when he talks to other owners about what they’re doing, it’s a slam dunk. “At the end of the night we used to have three or four garbage bags of waste. Now it’s a half a garbage bag,” he says. To become a part of Green Circle Salons, visit greencirclesalons.ca.